I took this picture last summer in a garden of sunflowers. The June Bugs were flying and crawling all over them. I snapped several shots until I caught this one taking a nap. I wanted to capture the brilliant colors of the flower, the bug, and the sky. I took the picture with the flower at eye level bringing the flower and bug into sharp focus. Lovely shot! 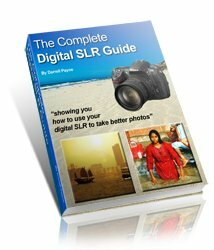 There's many elements to good photography - composition, lighting, focus, bokeh, ... I could go on and on, but the one that stands out for me here is colour! There's some great photography that uses an absolute riot of colour. Often these are urban scenes - things like the subway filled with joyous (?) graffiti. It's the colours that make the photo. And Sara's photo here certainly ticks the colour box. 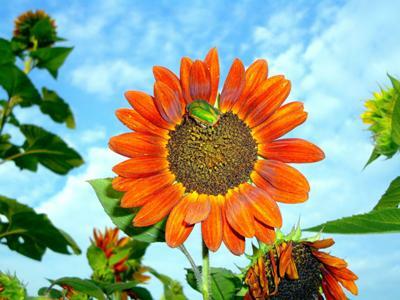 There's the bright orange flower, the green of the bug and the leaves, all set against a blue sky. The thing that helps to make a better colour photo (and by that, I mean the 'riot of colour' type photos) and that's to get the primary colours in if possible - that's red, green and blue. Sara's flower doesn't get the red in, but the orange is close enough. And the blue and green are both there - spot on! The other thing that Sara has done well here, whether deliberately or not, is to make use of the flash. I've written about this before, and it's worth repeating here, flash isn't only for night time! In fact, flash often ruins a night time photo - read more about flash photography here. But using flash in daylight can really improve your photography. Consider Sara's photo here; if there was no flash the bright orange flower would be in the shade, the colours would be dull, and the entire photo would lose its impact. Turn on the flash however, and the colours are bright and cheery! If you wanted to be really picky, two flashes, or a softbox (that's a light set in a large box, with a cloth over the front to diffuse the light) would be even better because it would eliminate the shadows caused by the flash. On balance though, I'd recommend using the flash rather than not, even with the shadows.